So I'm sure I'm not alone on this... How many of us have a piece of fabric that we just cannot bear to cut into? As I attempt to go through my fabric stash as we ring in the New Year, I realize that I have quite a few pieces of fabric that I simply cannot cut into. Sometimes, it's a matter of only having a small amount left and sometimes "it" seems to need just the perfect project. 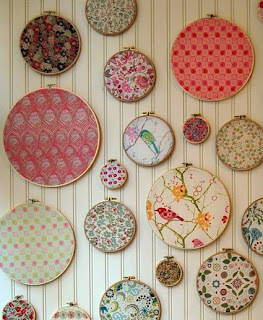 So rather than let them sit in a pile, why not display them as art in my sewing spot where I can be inspired by them? I started mine! I just have to get them up on the wall. Love this idea! Great post! This has inspired me so much - I can't wait to clean up the holiday clutter and get to creating! !